Castleford is a friendly lively market Town located a few miles north and east of the M62. It lies on the north bank of the River Aire close to its confluence with the Calder. A beautiful stone bridge crosses the Aire to link the town centre with the route to York and the A1. The local countryside includes the delights of the Fairburn Ings nature reserve which is particularly popular with bird watchers. Trains from Leeds, Wakefield (Kirkgate Station) and Sheffield visit Castleford. Just outside of the town are the Rivers Aire and Calder, Oxbow lakes and extensive low-lying pastures known as the Ings. The main influences in the long history of Castleford are depicted on its coat of arms which shows a miners lamp hung from the collar of a Roman Eagle. The Town’s origins are ancient. In the late first century and until 180 AD the Romans created an important settlement on the River Aire where Castleford stands today. This consisted of a civilian settlement around a military fort. It was known as Lagentium, or locally as Legioleum. Here travellers waited for the River Aire to become low enough to ford the river in order to cross it. This fort gave the town its name Castleford which comes from the Latin ‘Castrum’ meaning a camp or fort. One of the most notable Roman town centre sites is that of the Bath House on Aire Street. The settlement at Castleford continued after the Romans left until about 410 AD. The Anglo-Saxons occupied the area and called it Casterford (ford by the fort), which evolved into the village of Castleford. Recently the skeleton of a bronze age lord together with the remains of his chariot were discovered in Castleford's Fryston woodland. A long verse chronicle, written in Northern English, possibly written by a resident of the area, recounting the traditional history of Britain is known as "Castleford's Chronicle". Castleford also has a long tradition of flour milling. Allinson’s Stoneground flour Mill, located on Aire Street, has the world’s largest capacity for stone-ground flour production. However this site has been used for milling flour since Roman times. It has now been aquired by Castleford Heritage Trust Ltd who will develop this huge building into a community/ heritage centre with business units, a restored working water mill, restaurant and cafe. It will also house the Town’s Tourist Information unit. The Town we know today is a result of its expansion during the industrial revolution . During this period it was a boomtown; its population increased from below 1,000 to over 14,000 in just ninety years. This growth was built principally upon Castleford’s importance as a mining town. Although there had been mining in the area since the early 16th Century, deep mining only commenced in 1868 with the establishment of the Wheldale pit. However it was also an important centre for the manufacture of glass, pottery and and to a lesser extent these days chemicals. 40,000 and has become an major regional destination with the recent openings of the Freeport Shopping Village and the nearby Xscape leisure complex which includes a real ski slope. You can obtain more information on Castleford’s past by clicking on this link. The people of Castleford are proud of their Town and its rich and varied heritage is important to them. Extensive Roman archaeological remains are hidden beneath the surface of the Town’s streets. This was highlighted five years ago when Channel 4’s Time Team decided to spend three days on an archaeological dig seeking to find the route of the main Roman road, the boundary (or boundaries) of the several Roman forts and the location of any associated civilian settlement. Although they weren’t able to completely answer the questions nevertheless there were many important finds including assorted pottery, the edge of a Roman midden or rubbish pit and even some evidence of cremations. A group which formed to raise money for a new clock on the old Market Hall then turned its sights to the wider heritage of the area and formed the Castleford Heritage Group to campaign for a Heritage Centre for the town. This group organises a Heritage Festival which will usually take place between June and July. It aims to involve everyone with the Town’s rich heritage and history. The Heritage Group is a subset of the CTCP Ltd. The sculptor Henry Moore, one of the most influential sculptors of the 20th century, was born at Roundhill Road in 1898 and educated in Castleford. One of his reclining figures can be seen outside the Civic Centre. The Jungle located on Wheldon Road in Castleford is the home ground of Castleford's Rugby league team the Tigers which is a founder member of rugby league’s Super League. The ground has a capacity of 11,750. 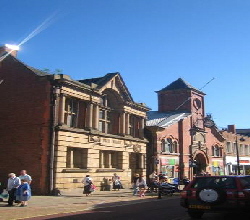 Castleford is a Market Town which has always had a reputation for friendliness and good value. Combine this with its plentiful car parking and the central location of the bus and train stations with good public transport links to Wakefield and Leeds, Castleford has much to offer and draws people from miles around. The outdoor market formerly behind Carlton Lanes Shopping Centre has now relocated onto Carlton Street and takes place on Monday, Thursday, Friday and Saturday. Castleford also has a large indoor market hall in this Shopping Mall. The original Market Hall was opened in the summer of 1880. But in 1927 a massive fire broke out in the Hall and destroyed the building. A new market Hall was built and in 1929 officially opened by H.R.H. the Princess Royal. Here it remained and flourished until in August 1991 when it it moved to its current location at the end of the Carlton Lanes Shopping Centre where it houses 73 general and food traders. The Market Hall is open Monday to Saturday with half day closing on Wednesday. The Carlton Lanes Shopping Centre is located in the centre of Castleford and comprises 107,000 sq ft. of shopping. It was which opened in 1991. There are 48 units in the site including Boots, Iceland, Wilkinson’s, Argos and Marks & Spencer. People of Castleford are proud of their town and are actively taking steps to regenerate it while respecting its character history and individuality .